Athyn Sarethi is a Dunmer agent and a Councilor in House Redoran. 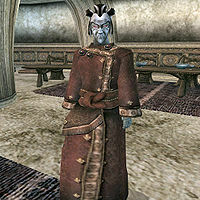 He can be found in Ald'ruhn in the Sarethi Manor in the Manor District with his wife Domesea Sarethi. He offers major training in Short Blade, and medium training in Light Armor and Sneak. He has powerful enemies; not only has he fended off three Morag Tong attacks already (one of which you get to witness), but his son has just recently been kidnapped as well. Athyn wears a chitin cuirass with matching greaves and boots and an extravagant robe with a matching belt. He carries the clearly misnamed Llethri Manor key and a dwarven shortsword. Aside from his natural resistance to fire and the sanctuary provided by his ancestors, he knows no spells. Sarethi is the author of The True Noble's Code. He is also mentioned in The Hope Of The Redoran.